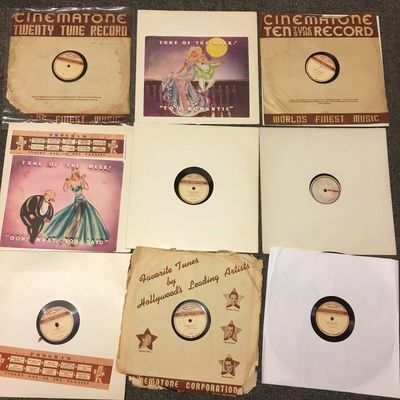 Up for bid is a collection of rare 1939-40 Cinematone Studios Penny Phono records. These are two-sided 12" variable speed records made specifically for the rare Penny Phono record machines of the period. Penny phono records were created in a specialized Hollywood Studio--the only coin operated phonograph manufacturer in the world making both the phonograph and the records. These were made for the Cinematone Penny Phono jukebox, by Cinematone. Only made in 1939-40 - and both the players and the records are very rare now. Also throwing in a few additional lithos, programs and sleeves. Records will be carefully packed with heavy cardboard double box, bubble wrap, etc. and shipped via USPS with delivery tracking/confirmation. Weight is 19 lb - please use this to estimate your shipping. Ebay shipping estimate MAY be wrong. I will invoice winner with actual shipping after auction ends. You will only be charged actual shipping cost. Penny Phono Jukebox made by Cinematone Corporation played the very special records which were made in Cinematone Studios exclusively for their jukeboxes and featured 10 tracks per record. These special variable speed records were distributed weekly by mail to the owners, bars, clubs, soda shops, containing the Penny Phono Jukebox machines.